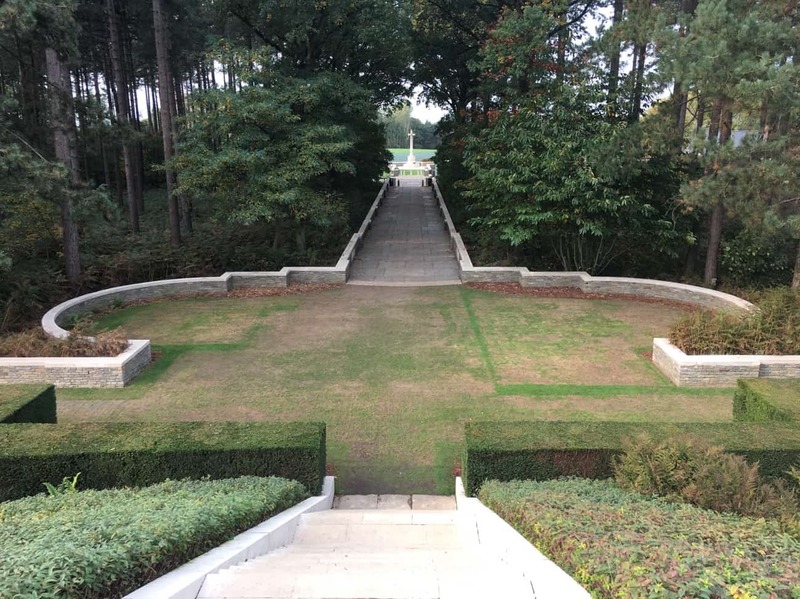 Visited: Bailleul Cemetery Extension in France, then Ypres, Tyne Cot Cemetery and Polygon Wood in Belgium. 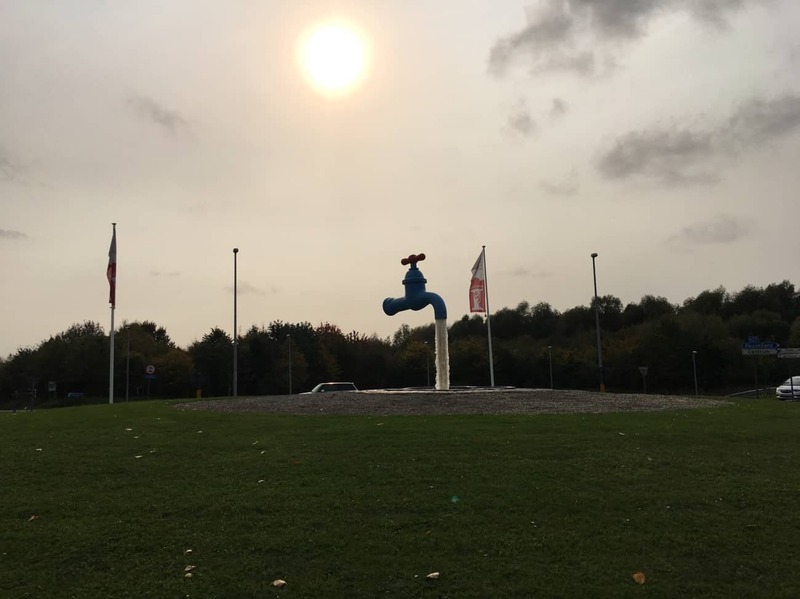 We check-out of Revin after servicing the Hymer. Saying goodbye to the semi-stray dogs that befriend everyone at dinner time. Today is a half-day of driving, we avoid the freeway and drive the D roads as best we can. 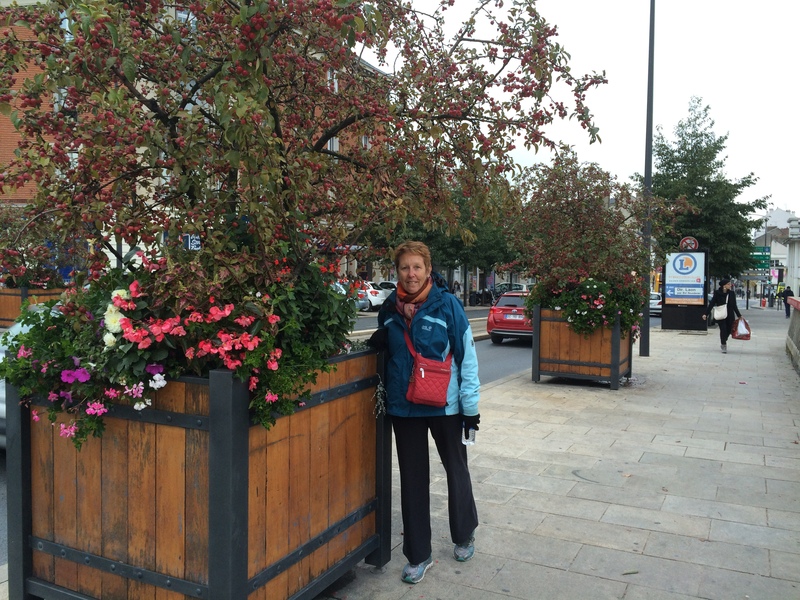 After stopping for coffee, then stopping for lunch we arrive in Bailleul (Belgium) mid-afternoon. Stop at a hardware store looking for a new filler hose without success before continuing on to the cemetery. 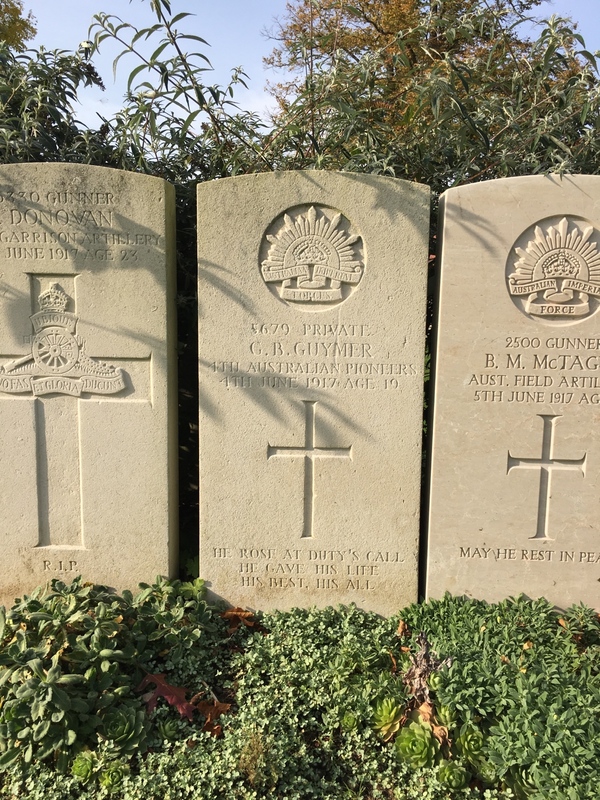 You may remember we have a Great Uncle George Bentley Guymer buried here in the Bailleul Cemetery Extension. 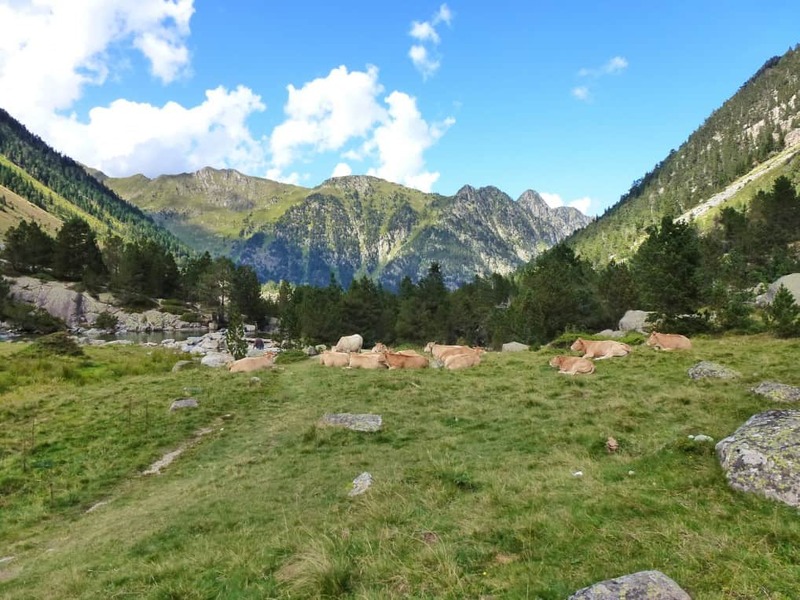 We are very close to the border with Belgium, it’s only a kilometres or so to the north-east. 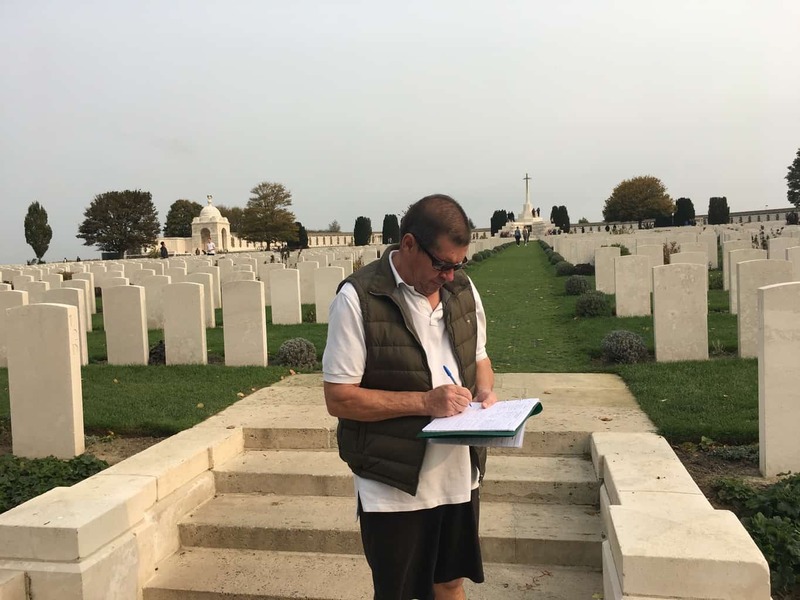 On the 3rd June 1917, George was wounded during an artillery barrage in the trench, his pioneer platoon were constructing, near Messines, Belgium. This was part of the preparation for the 3rd Battle of Ypres which commenced on the 6th June. 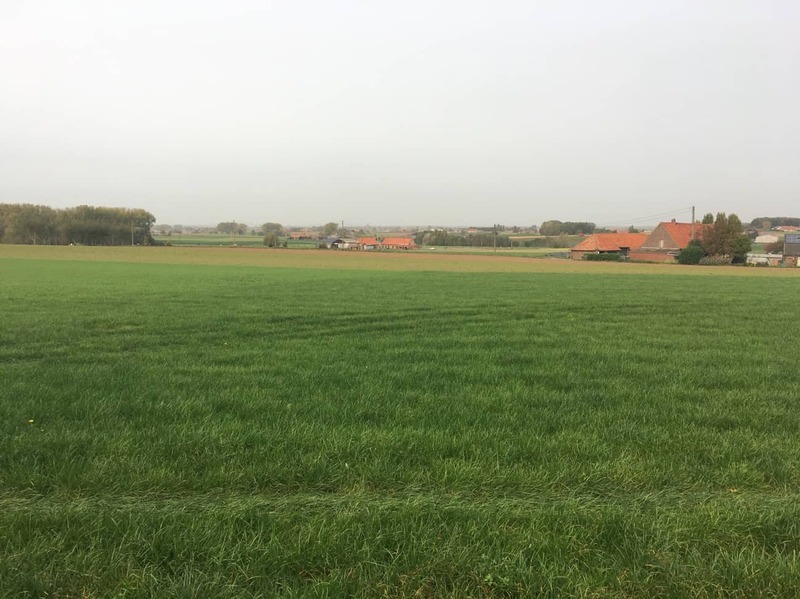 He was recovered by stretcher bearers and transported to the a casualty clearing station adjacent to the Hospital in Bailleul. He passed away on the 4th June, his papers indicating from a head injury. We first visited here in 2015 and it seemed only fitting to visit again on the centenery year of his loss. George Bentley’s grave at Bailleul, France. 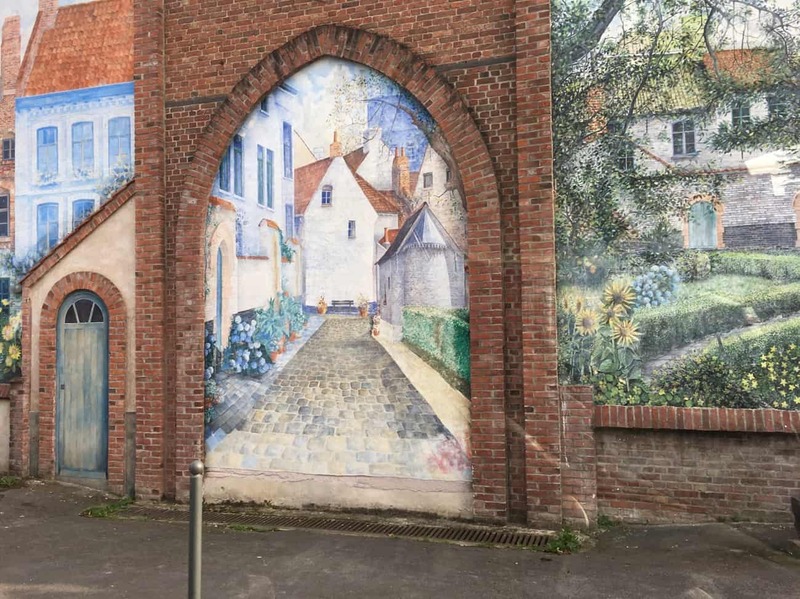 Thought you may like this bit of street art in Bailleul. 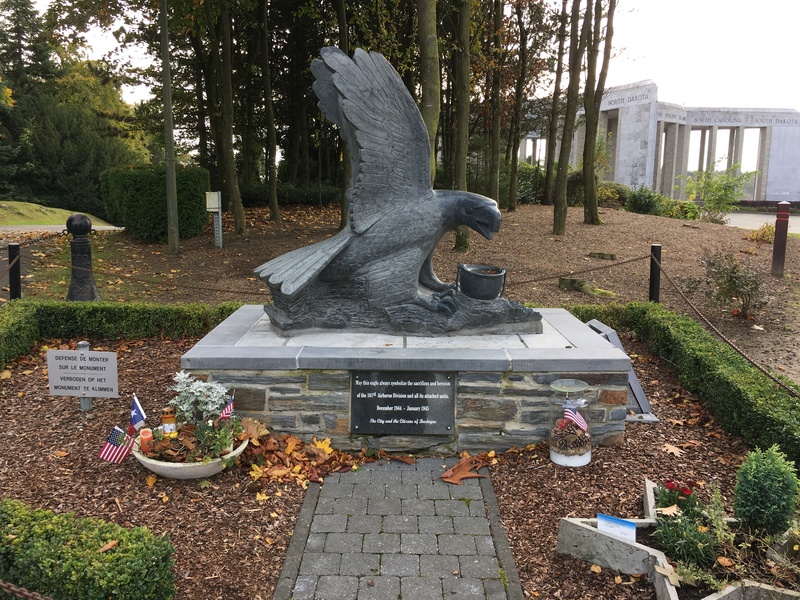 After paying our respects we continue on, crossing the Belgium border again. We park up for the evening in Ypres (one of our favourite spots). It turns cold and wet soon after we arrive and its a long walk to the Gate. 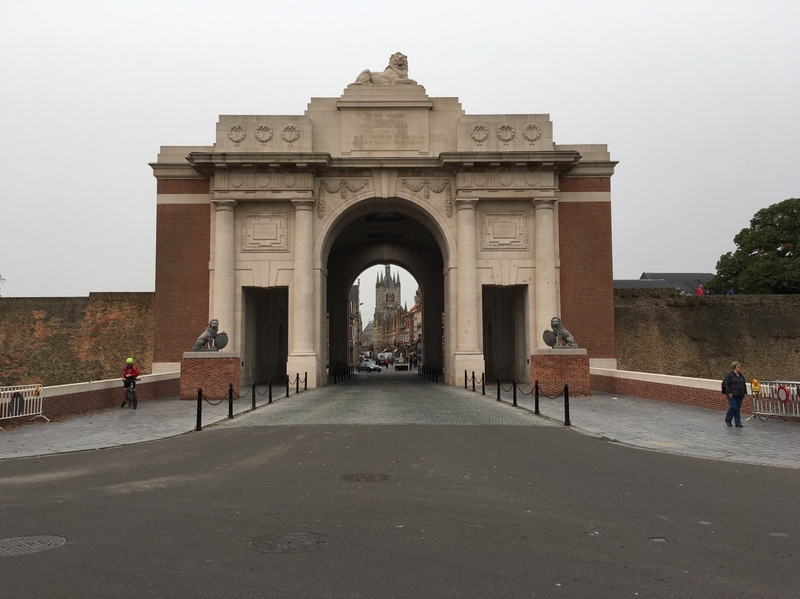 So we decide to walk up in the morning, weather permitting and it does… The Menin Gate. 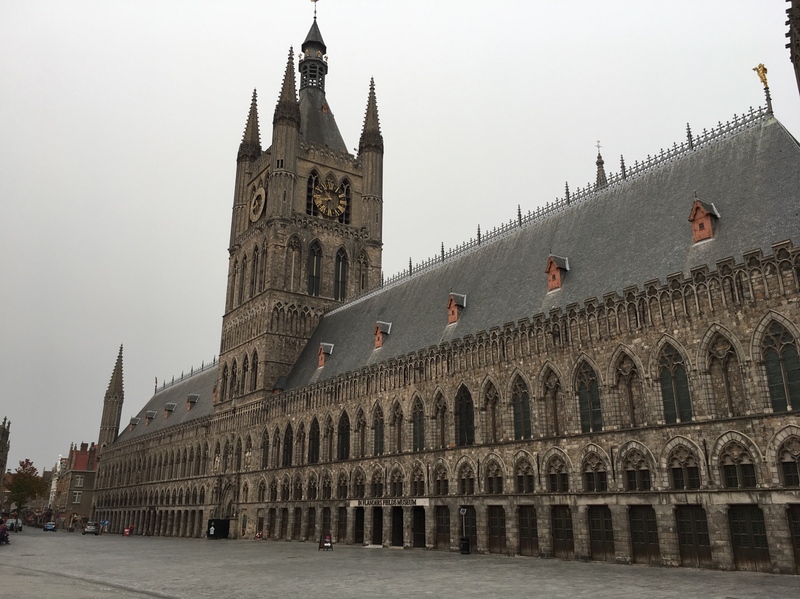 The famous Cloth’s Hall in Ypres. Now the Flanders Museum and the Tourist Info. 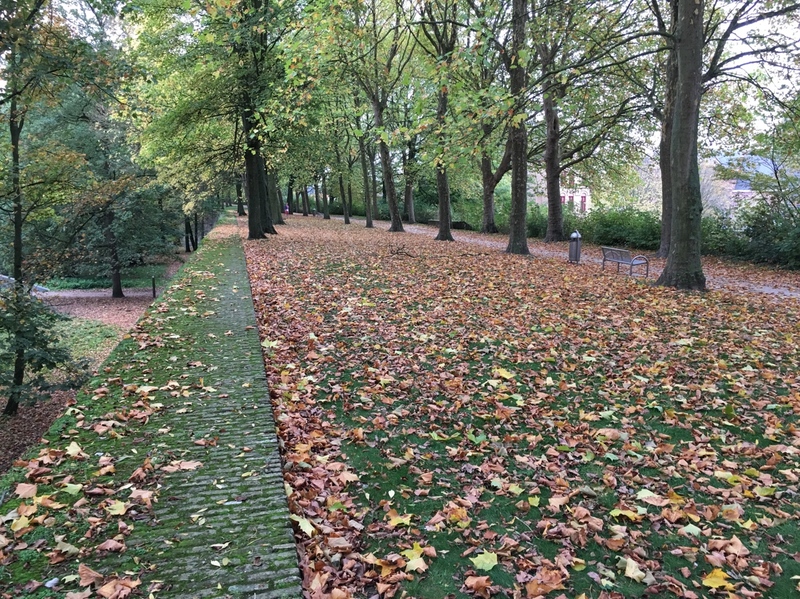 Autumn is in full swing here in Belgium. We walk along the old town walls, pretty isn’t it. After our second coffee we leave Ypres and continue north (about 8klm) to Tyne Cot Cemetery. 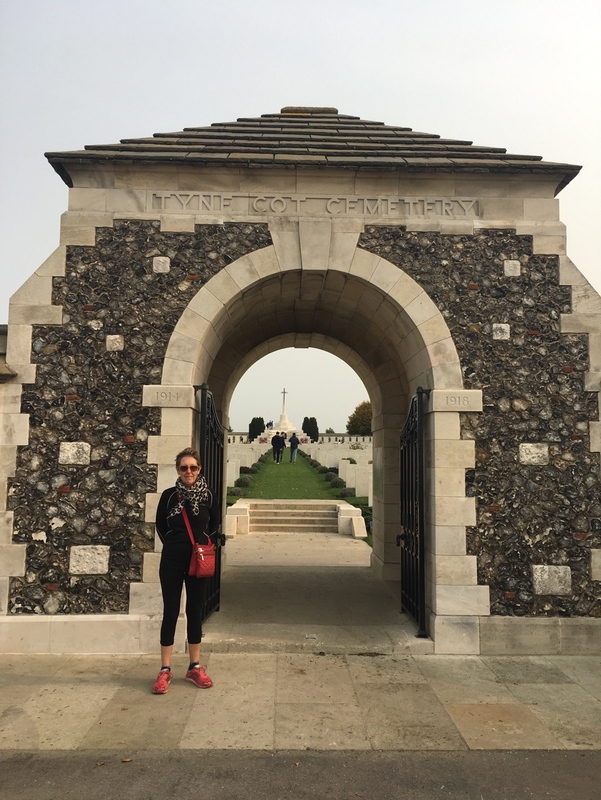 Tyne Cot is the largest British War Cemetery in the world. 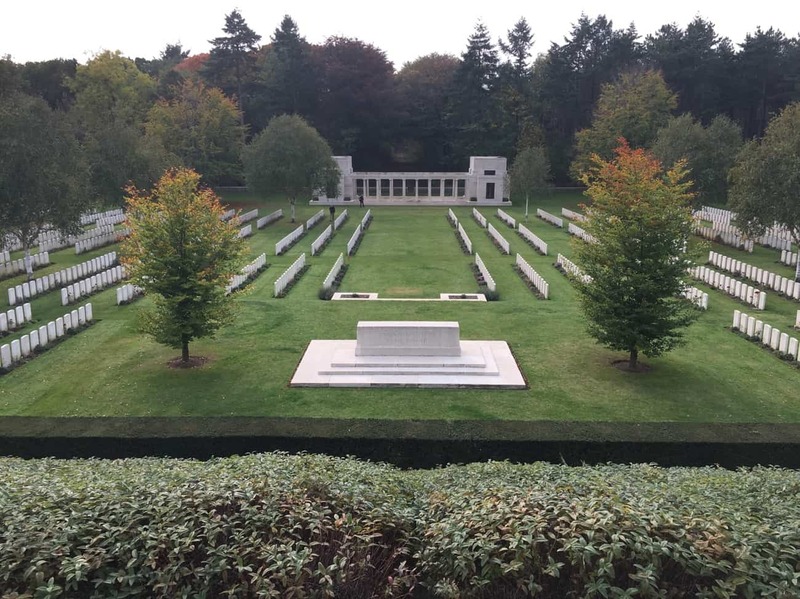 The remains of almost 12,000 soldiers are buried here. The names of another 35,000 dead, whose bodies where never recovered are recorded here. 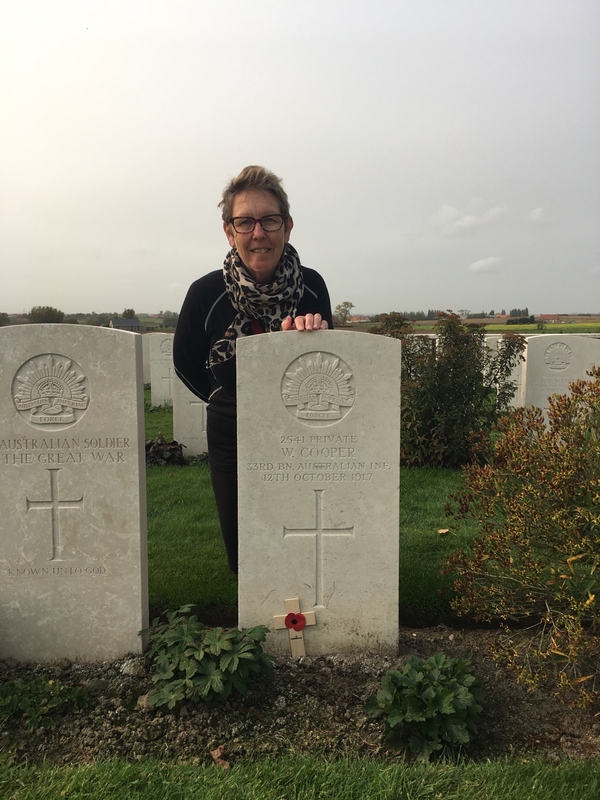 Pam at the grave of William Cooper, killed in 1917. We also visited Tyne Cot two years ago to find William’s grave and take a photo for a friend of Pams. Given it the centenary of his loss as well, we throught we should pay our respects again. Looking out from Tyne Cot across the killing fields of Passchendaele. 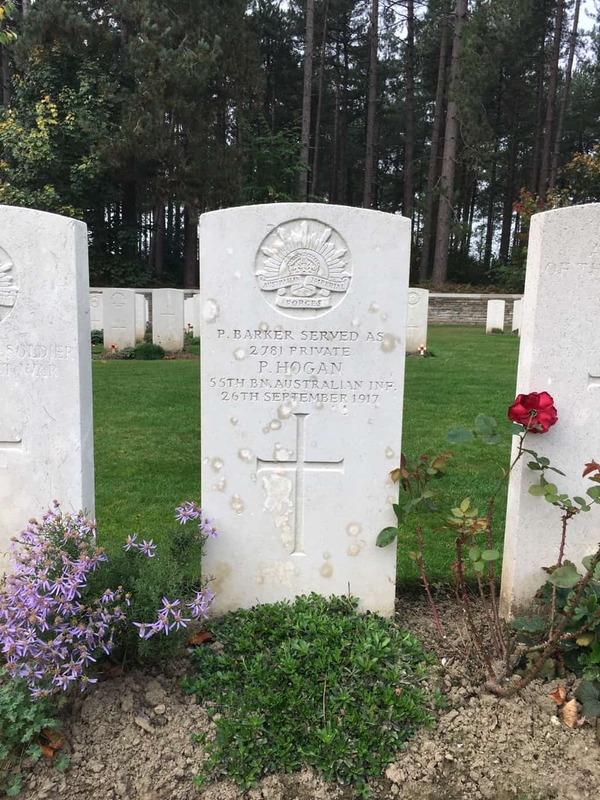 38,000 Australians were killed, wounded or listed as missing here in October 2017. So peaceful now. We back track a couple of kilometres to Polygon Wood. 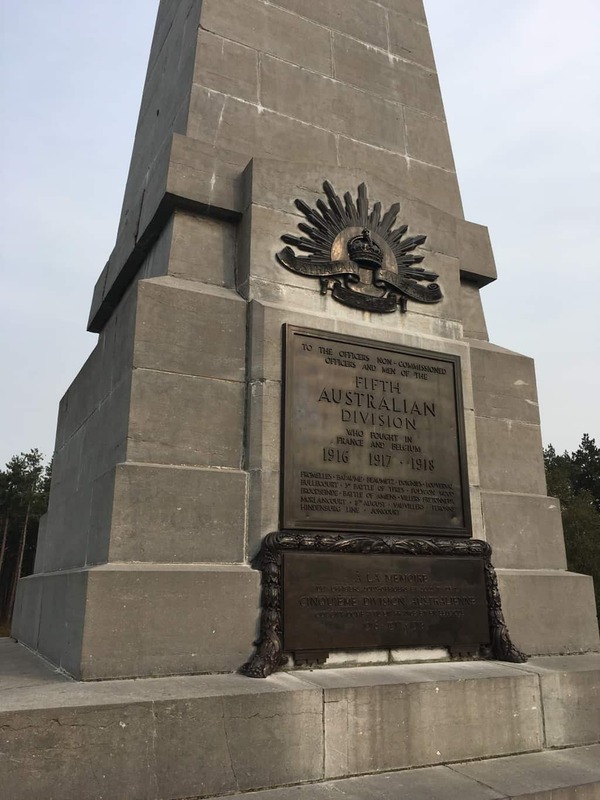 Standing on the Butte, the 5th Australian Division Memorial. From the Butte, looking down on the Cemetery. There are still some areas of discoloured grass from the official centenery function held here a few weeks ago. Another picture from the Butte, this one looking toward the New Zealand Memorial. Just a little explanation as I found the name Butte and the geography around the site strange. 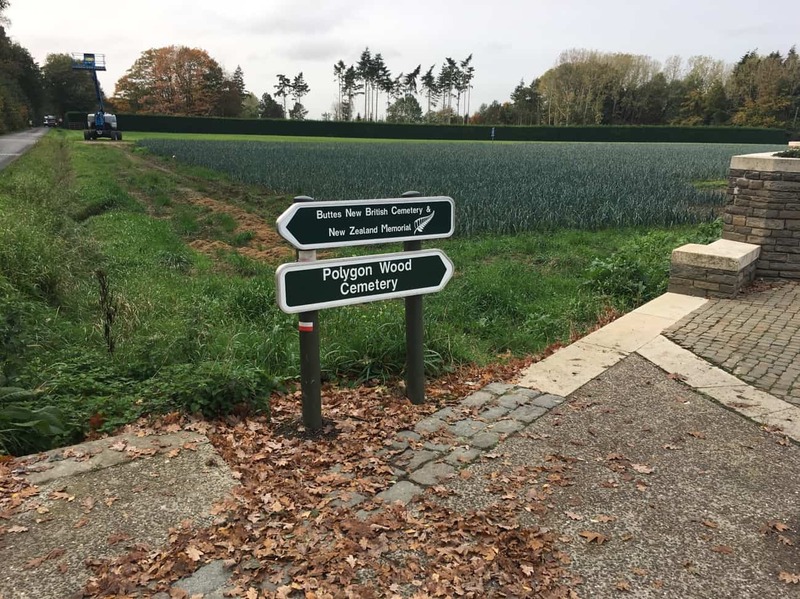 Polygon Wood was a forest rise 6 klm east of Ypres, before the first world war a strip of land had been cleared as a rifle range. At the end of that range on the crest a 10 metre high earth butte was constructed to stop the bullets after they passed through the target. 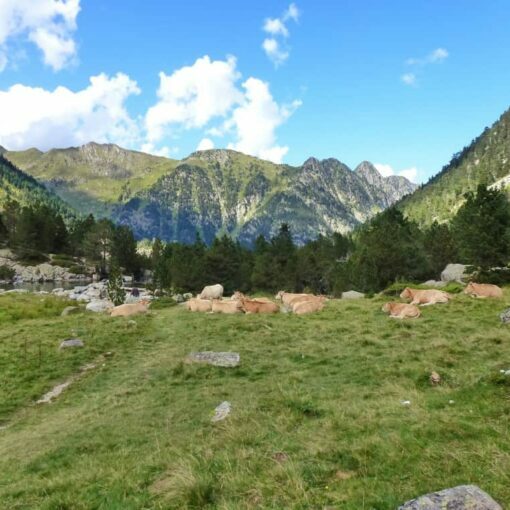 This piece of high ground had been taken and held by the German’s for almost two years when the Australian 5th Division along with New Zealand troops were tasked with retaking the Butte. It’s been a very moving afternoon visiting the battlefield of Flanders once again, unfortunately there are many more cemeteries and monuments we still need to visit, but there’s always next year. We depart for the aire at Watten about an hour to the south west in France. We have stayed here before, far enough from Calais to feel safe, but less than 30 minutes to the Chunnel terminal. 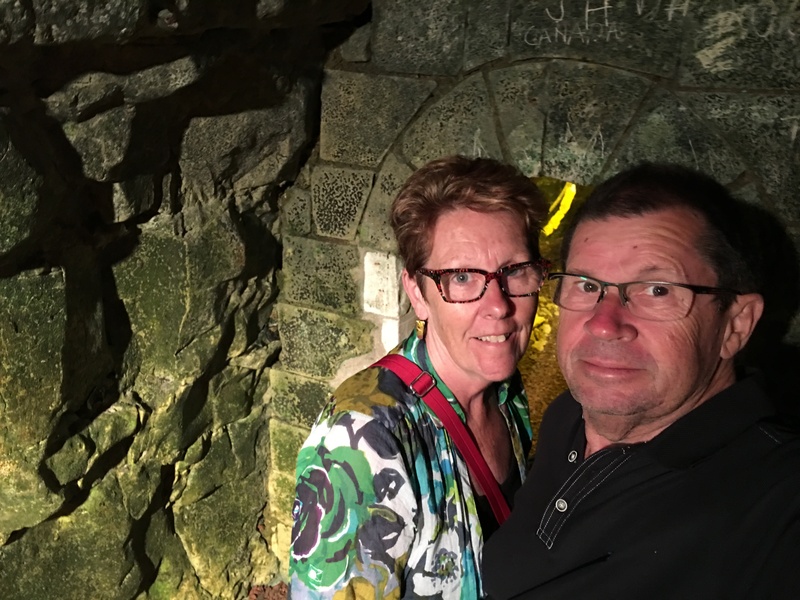 We visit a little bar in Watten discovered during our last visit, chat about our adventures this year. We have an early start in the morning and all the hassle of the added security at Calais to look forward to. 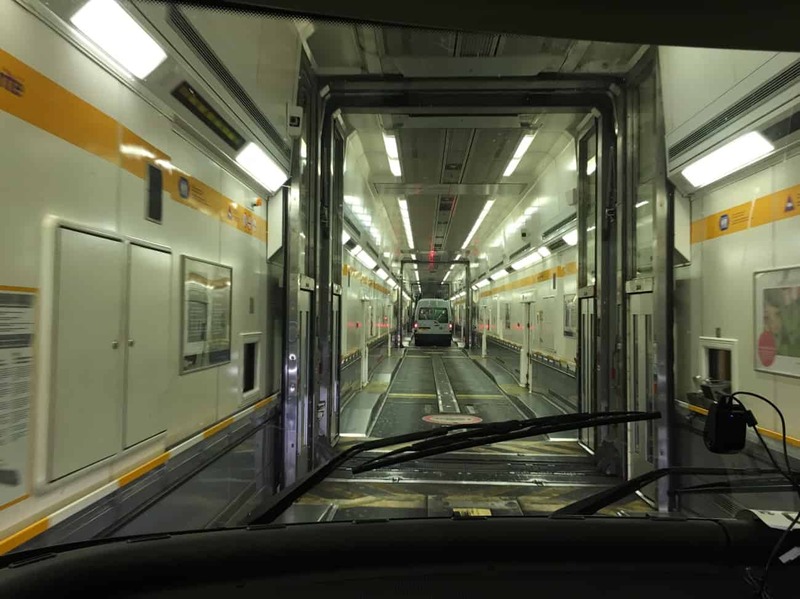 We roll onto the Chunnel carriage at first light, say goodbye to France for this year and relax with a coffee. Thank you for visiting Great Uncle George. RIP.